Global prevalence of chronic kidney disease (CKD) has increased significantly, along with the annual death rate due to CKD and the associated high cost of treatment. Oral and maxillofacial impact is noted in the context of CKD. This chapter provides an overview of the oral and renal association and mechanisms through which oral disease contributes to CKD risk. Authors also present technological implications and various risk assessment tools that can be used in clinical practice. Further, the chapter highlights the advancing potential for translation of precision medicine approaches to the clinical arena to optimize CKD management across the disease spectrum to improve CKD detection and outcomes. 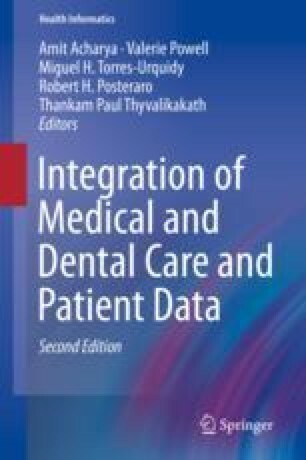 Finally, the chapter identifies important gaps in clinical practice guidelines with respect to advancing integrated dental-medical care delivery due to absence of emphasis on potential oral-renal interactions which have been demonstrated and validated in the evidence base by systematic review. Centers for Disease Control and Prevention. Chronic kidney disease (CKD) surveillance project. 2018. https://nccd.cdc.gov/ckd/default.aspx. Accessed 10 June 2018. Centers for Disease Control and Prevention. Chronic kidney disease basics. Chronic kidney disease initiative. CDC. 2017. https://www.cdc.gov/kidneydisease/basics.html. Accessed 30 Aug 2018. Gheewala P, Peterson G, Zaidi S, Jose M, Castelino R. Evaluation of a chronic kidney disease risk assessment service in community pharmacies. Nephrology. 2018a; https://doi.org/10.1111/nep.13247. KDIGO. Guidelines. KDIGO; 2018. https://kdigo.org/guidelines/. Accessed 9 June 2018. National Kidney Foundation. Global facts: about kidney disease. National Kidney Foundation; 2015. https://www.kidney.org/kidneydisease/global-facts-about-kidney-disease. Accessed 9 June 2018. National Kidney Foundation. Global facts: about kidney disease. 2017. https://www.kidney.org/kidneydisease/global-facts-about-kidney-disease#_ENREF_3. Accessed 30 Aug 2018. NIDDK. Kidney disease statistics for the United States. NIDDK; 2018. https://www.niddk.nih.gov/health-information/health-statistics/kidney-disease. Accessed 9 June 2018.